The days leading up to it, it didn’t feel like a real thing I was doing. The ring was ready on Saturday, but the jeweler was 50 miles away, and I had to pick it up secretly. They were closed on Monday. Tuesday I had too many meetings to sneak out during the day when she wouldn’t notice I was gone. On Wednesday, she took my car to work in Kansas City. I borrowed Jacob’s car and drove to pick it up that afternoon. She would never suspect I was just a suburb away signing for a tiny velvet box with two months’ salary glimmering inside. Thursday she had a wedding for a friend at Oceans of Fun. They got married on the Aruba Tuba. The bridesmaids were mermaids. Time was running short. Friday was it. I asked her if she wanted to invite her friends over for dinner, to celebrate moving in to our new house together. Kate and Chloe were already in on the plan, but they told her they didn’t have any plans. They would love to come. Chloe bought the blender the week before. 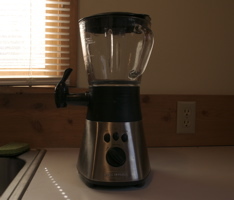 It was a fancy blender with a smoothie spigot and a food processor attachment. Laura wanted one just like it. She said so repeatedly. Friday I left work early and met Chloe at the Merc. She just got promoted to manager of the general merchandise department there. She’s been really busy the last few weeks, but she took off early to meet me. I showed her the ring in the produce section. She made excited noises and people stared at us. We joked around that I was proposing to her at the grocery store. I started to get nervous. We walked around and picked up ingredients for dinner. Chloe picked a salmon recipe with soy sauce. The guy at the seafood counter showed me his wedding ring and gave us a deal on the fish. We went to the back room and picked out fruit for the blender. There was no way it was going to be a surprise. She’d helped me pick out the ring. We’d already talked about who would cater the wedding. She knew it was coming. I needed a decoy. I needed a blender. This was the plan. At dinner I would tell Laura that I had a special gift for her to commemorate our new home, something she had been wanting for a long time. She would think I was talking about the ring, but I would give her the blender instead. At first she would be disappointed because it wasn’t the ring. Then she would be excited because she really wanted a blender just like that. Then she would be even more excited, because it really was the ring, hidden inside the blender under a pile of peaches and bananas and a Chinese pear. This was as close to a surprise event as I was going to get. It had to work. Kate had to babysit until 9, so we planned a late dinner. Chloe was running late because her famous Douglas County Pie was taking longer to bake than she expected. Around 8:45, she dropped off the fish and the rest of the ingredients and left again to pick up Charlie from work. Charlie was going to help set up the hammock outside while we served dinner inside. We layed together on that hammock on our third date, almost a year ago. Laura would be excited to have it back. Laura wasn’t in such a great mood. She was worn out from work and moving the week before. She couldn’t figure out what Chloe was planning to make with the random ingredients she’d dropped off. She grabbed a box of rice pilaf from the pantry and started some water boiling. I tried to intervene, without letting on that Chloe and I had planned the dinner down to the last detail. I’m sure she has a plan for those noodles. She mentioned something about the noodles. Why don’t you lay down? After calling Chloe to confirm that she did in fact have plans for the noodles, she let me talk her into laying down upstairs while I cooked. Chloe and Charlie arrived first, with the blender and the hammock. Chloe came inside to distract Laura while Charlie set up the hammock outside. Ten minutes later, Chloe went outside to check on Charlie. She came back inside with a panicked look on her face. I stared at her for a second, trying to figure out if she was messing with me. We’d joked about it earlier that day. I’d specifically told her it would not be cool to mess with me. I had visions of Charlie getting mugged in the alley, or smashing the blender and running off with the ring, never to be seen again. Charlie’s a great guy of course, but you never really know about people until you trust them with heirloom jewelry. When I followed Chloe outside, we saw Charlie walking back across the alley. When the blender broke, he’d run to the gas station across the street to call Chloe. He was pulling the hammock out of the car, and the blender fell out and smashed on the ground. He really did run off with the ring, but to Texaco, not Mexico. We all breathed a sigh of relief, and then proceeded to freak out. Chloe took charge. She and Charlie would book it to the Merc and replace the blender. I’d distract Laura. Laura was in the kitchen when I got back inside. All the food was ready, and none of the guests were present. Chloe and Charlie got in a fight. They had to go for a drive. Want me to go get a bottle of wine? Kate arrived just after Laura left to walk to the liquor store and I caught her up on the story so far. We sat in the living room and waited. I noticed I was starting to sweat. Laura came back first with the wine, and Chloe knocked on the door soon after. She gave me covert thumbs-up on her way in the door and proceeded to act like a girl who just had a fight with her boyfriend. When Charlie came in covered in sweat from setting up the hammock, he played along too. They fake-pouted at each other all through dinner. When Laura wasn’t looking Chloe grinned at me and bounced up and down on the couch. After dinner I stood up to make an announcement. I’d like to do something special in honor of our first dinner with our friends in our new home. Laura started to laugh nervously. It was working. To commemorate the occasion, Laura I’d like to give you something you’ve been wanting for a long time. Now she was blushing. Perfect. Her face lit up when I walked back in with the blender behind my back. Then I showed it to her. The look on her face was priceless while she registered disappointment, suprise and excitement all at once. And suspicion. She knew something was up now. She was starting to get wise. I had her set the blender in the kitchen while we ate dessert (Chloe’s world-famous Douglas County Pie) and drank the rest of the wine. Then I asked Laura if she wanted to make a smoothie for everybody with her new blender. By now she had it all figured out. She lifted the pieces of fruit out of the blender one by one, until all that was left was the tiny blue box at the bottom. I wonder what that could possibly be. She wasn’t going to let me get away without knowing she’d caught on. All my life I’ve never known anyone as perfect for me as you. And I know I never will. She said yes almost before I finished saying ”…do me the honor of being my wife.” I don’t know why I was relieved, but I was. I fumbled with opening the box, but she took the ring and put it on her finger herself. She cried for a long time. I hugged her for a long time. After talking about it for months and knowing it was coming all along, it was a real thing now, and it was sweet and strong and strange. All the feelings you read about in sappy books and don’t really believe exist, at least not for you. It was one of those once-in-a-lifetime moments where you can see yourself from outside yourself because it’s so overwhelming to actually be there. Like seeing the Mona Lisa in person, only bigger. Much bigger. Even later, after we’d hugged our friends, after we’d gone out in a daze and accepted all the congratulating handshakes and hugs, after a bottle of champagne that couldn’t make us any more intoxicated than we were before we started drinking, I could still feel it. We could have been standing there forever. Maybe we were. Maybe we still are. It’s been quite a summer. I tell you what. Fine writing old boy, you are one of life’s winners. Congratulations to you both. To Wilson and Laura, the best Friendster couple there ever was. I hope the years are as good, and as full of surprises, as this story. Congrats Wilson! You deserve it. I have to say, I felt kind of guilty getting engaged in front of a couple who just had a fight. Nobody let me in on that for a while. Congratulations, great story. Wish you tow could be here with us. We are having fun with your family. Thanks Al! Wish we could be at the lake this year too. We’ll promise to make it together next year. Drag some grandkids around the lake for me. You have a bright future. You both do. Your blog thinks you are cheating on it with Laura. It is 100% correct! Less exciting, but more profitably, I’m cheating on it with a giant pile of crap to do. Hey, congrats! My wife and I had a similar predicament, in which she had already been involved in choosing the ring, etc. I had a pretty lame way of proposing. I think your’s was far smoother (pun intended).